The Don Who's Taken Charge Of Jordan's Biggest Refugee Camp : Parallels After fleeing his native Syria, Mohammad al-Hariri became the most powerful man in the Zaatari refugee camp in Jordan, where more than 120,000 refugees live. Aid workers view him as running a criminal enterprise, but they appear to have little choice but to work with him. 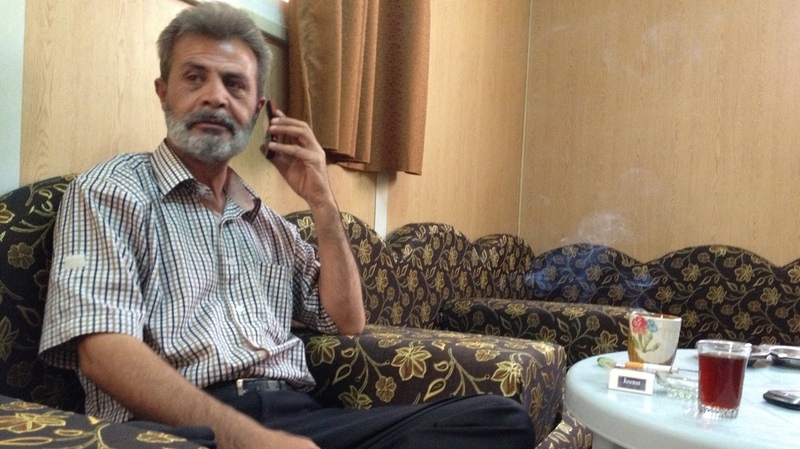 Mohammed al Hariri is known as the mafia don of the Zaatari Refugee camp. He is the man who gets things done. In chaotic situations, certain people rise to the top, and that is certainly the case for Mohammed al-Hariri, a former air conditioning repairman who commands enormous deference on the windblown streets of Zaatari refugee camp. In less than a year, the Zaatari camp in Jordan has grown into an instant city, with 120,000 residents who have fled the war in Syria, sheltered in trailers and tents. Officially, aid workers manage the camp. But Hariri is the de facto boss, a mafia don to Syrian refugees who seek his help. At 48, he keeps his gray beard trimmed, and his steely hair, which stands high on his head, appears blow-dried. His shoes are clean and polished, remarkable on the dusty streets. He is deceptively small, almost delicate, but there is nothing gentle about the way he has built an empire in the camp, living in relative luxury. "This is the kitchen," he says, as he gives a tour of his living compound. "It's a humble kitchen as you can see." The well-stocked pantry is hardly humble by refugee standards. Hariri has a private water tank and bathroom. Artificial turf in his courtyard gives relief from the sand and rocks. His children watch cartoons in a separate air-conditioned trailer. Another trailer is a storage room filled with blankets and food. Three small refrigerators hum in the storeroom. Hariri freely admits tapping into electricity from an Italian hospital nearby and helps others get free power, too. "Look, everyone does it," he says, jabbing a cigarette in the air as his temper rises. "But know this," he continues, "we are in the 21st century, even animals in a barn have electricity." Hariri can deliver more than electricity to upgrade the refugee trailers that line the dirty streets. He offers a tour of his section of the camp: His workmen have created decorative fountains out of concrete and stone in shaded courtyards behind corrugated metal front gates. The clear pools and bubbling water cools the desert air. "A cup of coffee by the fountain in the evening, it's an extraordinary thing," he says, juggling calls from two Nokia cells phones, "and you enjoy the wonderful weather of Zaatari." Hariri makes no apologies for running what aid officials consider a criminal racket. He insists he serves his people. He gets them what they want. He rages against the aid worker he considers stingy and heartless. "They are thieves and robbers and they are corrupt," he says, though he offers no specifics. Before he became the boss here, he says he taught air-conditioner repair in a technical school in the Syrian town of Dera'a. When the protests started against President Bashar Assad, he immediately joined a rebel brigade and became commander of a special unit in the Falcons of the Tribe of Mohammed. Hariri says he specialized in mines. In August of last year, he fled to Jordan and saw how he could be another kind of leader. His first lesson came on the day he arrived, the 60th refugee in Zaatari. He asked for extra blankets. An aid worker told him he would need a special coupon. His response: "Give me the stuff now or I will separate your head from your body." He got the blankets, and then began building his empire. Ask how he does it, and he won't give a straight answer. There are rumors in Zaarati that he can have people killed. "I could, if I wanted to," he says, dismissively, "but I would never let it get to that point." He claims he can solve problems in the camp, stop the riots that have resulted in injuries to Jordanian security police. Solutions are what everyone is looking for in Zaatari. Aid workers want to stop the violent protests, the looting, the trafficking and the stealing of electricity. The refugees want dignity and safety in a camp that is now as big as a city. "He's acquired wealth and he is powerful," acknowledges Kilian Kleinschmidt, a burly German aid worker who manages Zaatari for the U.N. refugee agency. He was sent to the camp by the U.N. to restore order because he has a reputation for solving impossible problems. Zaatari is the most daunting challenge of Kleinschmidt's career. Kleinschmidt introduces himself as the mayor here, and a few weeks ago he agreed to meet Hariri. "We made a deal that we wouldn't work against each other," says Kleinschmidt, "because we are two powerful men, so, if we would work against each other, the camp would explode." Kleinschmidt thinks more like a mayor than a manager for 120,000 Syrian refugees. He's promised to put in streetlights. His aim is to get every refugee out of the tents and into trailers by the end of the year. He says he understands these refugees, the toughest he's ever met. "They rebelled against authority. Authority was something negative," he explains, describing the Syria revolt. He wants camp residents to recognize that authority can be something positive, if it's directed in the right way. "If it becomes good governance, that is one of the contributions to the rebuilding of Syria," he says. His deal with Hariri is a step to bring illegal activities out of the dark. "We will establish the rules and continue to work together," he says. "We are testing each other. He tests me and I test him." Back in his shaded courtyard, Hariri continues to see a stream of visitors. Two women sit in plastic chairs and pour out their troubles. One says her daughter is about to give birth, she wants to go back to Syria to be at her side. The other's husband is stuck at the Jordanian border; the Jordanian police won't let him pass. Can Hariri get him in? Hariri snaps open one of his cell phones and barks out orders. "OK, it's been solved," he says to the women. They are grateful and relieved. How he solved it, he wouldn't say.